I never had the patience for European History at school. All those kings chopping off people’s heads put me off, but Just a Girl is not a history text. Elizabeth’s voice seduced me from the first page. Unable to sleep on the night before her coronation, she begins her memoirs. Chatting directly to me on the page, she leads me into her world. Important moments in her life spring to life as I walk beside her. I’m touched by those who remained faithful, even under threat of torture and possible execution. The swaying loyalties of courtiers and politicians become understandable in the knowledge of the dangers of the times. When you are a potential heir to the throne in the 1500s and your father has a habit of ordering the execution of his loved ones, there’s not much chance of a normal childhood. Things get even more precarious when your half-sister receives the crown and fears your influence as an adversary. I was enthralled by the gossip and personal conflicts, but it was the poor hapless Elizabeth managing to keep herself alive despite suffering physical and emotional neglect that kept me glued to the page. Can you imagine the possibility of living and dying relying on the whim of an estranged half-sister? What do you do if your stepmother’s handsome husband makes romantic or physical overtures? Being 16 and longing for love leaves you vulnerable. The result could be disastrous. Even if some scenarios are only conjectures, they are juicy conjectures indeed. Although about 50 pages too long for my flighty attention, Just a Girl was a satisfying read. I know more about these times than the best intentioned teacher could ever have taught me. 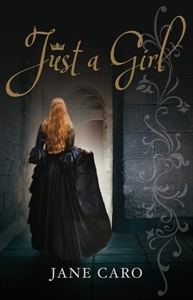 If you love journeying into a foreign world and witnessing the unimaginable, then Just a Girl is for you. Even if you are not usually into history, give Just a Girl a try. You are sure to enjoy the ride.